A reproduction of the “La Chasse de la Licorne” (The Hunt of the Unicorn), “Licorne a la Fontaine” shows a unicorn cleansing the water from a fountain after it was poisoned by serpents. In 15th century France, the healing properties of unicorn horns were believed to be well known. 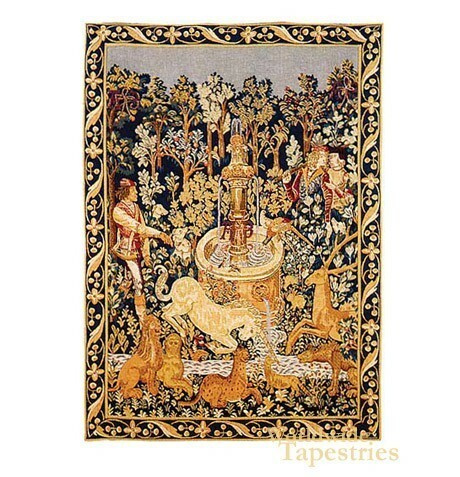 Other animals present in the tapestry carry additional meanings. The dogs stand for trust and fidelity while the rabbits are associated with fertility. The presence of these animals shows this was most liked intended as a wedding gift. In fact, it’s believed the original was commissioned as a wedding present for Anne of Brittany and Charles VIII in 1491. The original tapestry can be seen at The Cloisters Museum in New York City. “Licorne a la Fontaine” is lined and has a tunnel for easy hanging.